Banyalbufar, a municipality situated in the south east of the Tramuntana mountain range between Estellencs, Esporles and Valldemossa, has a population of approximately 500 people and its characteristic scenery is formed by the surrounding mountains, the spectacular terracing dedicated to cultivation and the abrupt coastline that goes from the Racó de s'Algar to the Port des Canonge. The origins of Banyalbufar are to be found in the Arab property that was founded in the X century with the name Banyalbahar, a moslem toponym that means "built next to the sea". After the reconquest of Mallorca, the town was assigned to Gilabert de Cruïlles and Ramon Sa Clusa, nobles who participated in 1229 in the military expedition together with King Jaume I, and in 1392 the Baronia de Banyalbufar was created, with civil and criminal jurisdiction over all the inhabitants of the town. Traditionally dedicated to animal farming, fishing and agriculture, where it stands out for the production of sundried tomato strings and malvasia wine, today in the process of recovery, Banyalbufar has become a tourist town without losing its singular charm and has a small, but select, choice of accommodation: the Hotel Baronia, in the old palace of sa Baronia, the Hotel Sa Coma, the Hotel Mar i Vent, the Hotel Son Borguny, the Hostal Rural Ca'n Busquets and the Hotel Rural Ca Madó Paula. It also has an interesting selection of bars and restaurants, two of them in the Port des Canonge, a small village on the border with Valldemossa. Of the many excursions that can be carried out in the area, the most well known and recommendable for everyone, is the one that goes from the centre of Banyalbufar to the Port des Canonge, following the old road called the Volta des General. 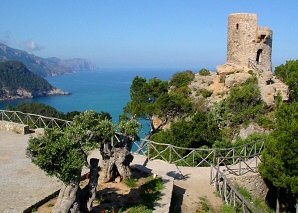 Amongst the places of interest are the Verger Tower or Talaia de ses Ànimes, an ancient defence tower on a cliff over the sea just outside the town towards Estellencs, from where an impressive view of the coast can be seen, and the ancient palace of the Baronia with an interior courtyard and a defence tower from the XVII century. More information about the town can be found on the webs of the Banyalbufar Town Council and the Associació Cultural Bany Al Bahar.